Effort-Reward Imbalance model is known as one of the survey method of occupational stress and also as an effective element on health condition according to its parameters. Due to types of rewards generally, and reward subscales in this model specifically, each one can have a distinctive effect on health perception, current study is aimed at determination of the most effective reward subscale for managing work-related neck disorder in industries. All of workers who participated in IPWS study (N = 1126), were entered in the statistical analysis stage. After completing personal and organizational information, they responded to Van Vegchel et al. Effort-Reward Imbalance and also Dutch questionnaires for their musculoskeletal disorders. Chi-square and t-test comparisons were performed and the final regression model was presented with a significance level of 0.05. The mean (Standard deviation) age of workers and musculoskeletal disorders prevalence in neck were 33.21 (7.63) years and 34 percent respectively. Also in workers with neck pain, odds ratio between effort and monetary reward, between effort and respect reward, and between effort and security reward in their jobs were 1.35, 2.07 and 1.32 respectively. After elimination of confounders in final regression model, significant correlation was remained only between effort and job respect reward. 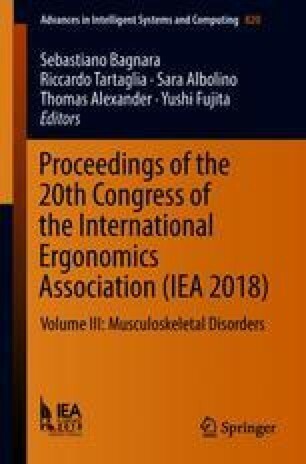 According to high prevalence of musculoskeletal disorders in neck and also large amount of effort-reward imbalance in Iranian workers, implementing interventions are recommended. Based on results of present study, it is suggested that main intervention must be focused on respect and esteem reward in jobs. This research has been supported by Tehran University of medical sciences. Also Researchers are thankful for all participations in this study.